The Coral Castle. Miami, FL. I love secret gardens, all gardens, parks, wild pockets of nature in the city. These healing spaces make me feel at home. I grew up with my very own garden as a child, my love affair with nature started really young. Today I want to take you on a journey through an enchanting place I fell in love with recently.. 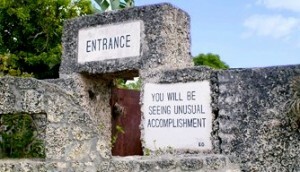 This photo with the sign entrance that pays homage to the nature of your discovery beyond the threshold that invites you in: “You will see unusual accomplishment,” belongs to the Coral Castle. All other photos were joyfully taken by me. Some places find their way to our heart in an instant. The Coral Castle in Miami is one of those places, a rustic sanctuary built by a man as a testimony to the love of his life. He built a magical home and garden, a sanctuary to love itself. This man lived a very simple, stoic, and yet remarkable life. He was able to create magic with his own hands. A world unto itself, one that vibrates with love, a love you can feel, breathe and see with your heart. 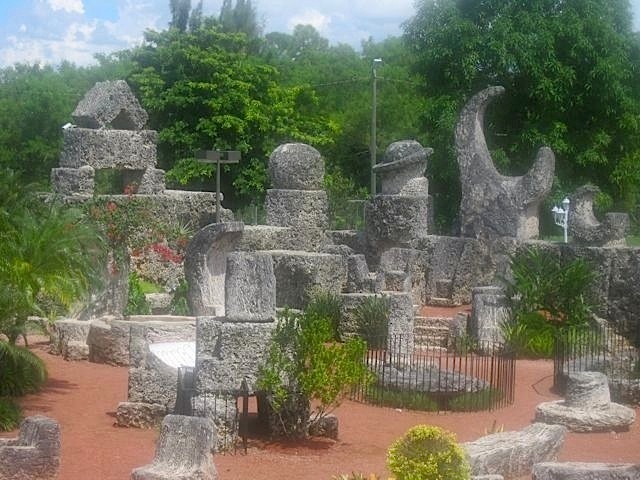 The Coral Castle has a garden that is whimsical, playful, filled with ancestral remembrance of what it means to be alive, connected to self, spirit, soul, earth & cosmos. Every detail was literally carved with love. And you can feel it. This garden furniture is made from coral rock. Even the rotating door! 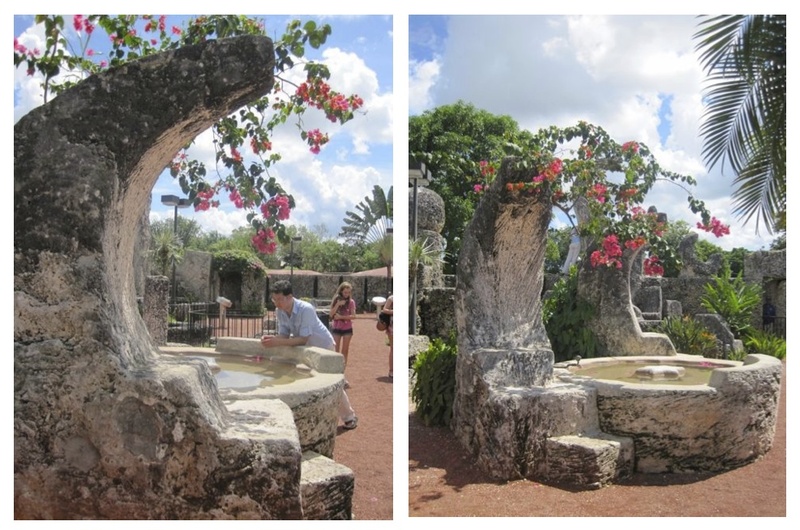 The Coral Castle is a secret garden that tickles your imagination, amplifies your energy and melts your heart. In the tradition of our ancestors who aligned with the earth and the stars in a harmonious way, Edward Leedskalnin, designed and built this coral castle with homemade tools from 1923 to 1951. Ed was able to achieve something mysterious and extraordinary, he was able to carry and carve a total of 1,100 tons of coral rock. He claimed to have the secret ancient knowledge of physics used to build the pyramids, to move and carve his stones, or how else could he have built all this by himself? He used a local material called coral rock or oolithic limestone. It is fossilized stone of beautiful organic forms. Beautiful moon fountain at coral castle! I love the connection between matter, form and energy. Scientists say that an image that evokes a feeling or memory can light up the same part of your brain that lights up when you are physically there. We are still scratching the surface of energy. The Coral Castle is a place for you to stop, slow down, meditate, walk, enjoy, breathe, watch the stars, discover, make space for beauty to dance in your heart. This is the power of a place made with love that vibrates your whole being to pulse alive as part of the whole web of creation. Nature is so alive here. The beauty of the plant, animal and mineral world. Here you can see Ed’s truly astronomical creations: the gorgeous sun dial that lets you know the time of the day and the lovely Polaris telescope that lets you gaze at the North Star! The Coral Castle is nourishing, energizing, revitalizing. It is enchanting, surreal, and peaceful. As you cross the threshold and enter the garden, you feel a child again. This place awakens your curiosity, your desire to touch, feel, and be fully alive. I feel the pull to go back and continue my exploration, the way you return to a book that becomes a friend, revealing new things with every read, every visit. Lush flowers at coral castle. Tropical paradise! I started writing this post yesterday and it dawned on me that today marks the beginning of the New Year in the Chinese calendar. Today begins the year of the Water Dragon. Dragon, a mythical figure of great power. Here is a drawing I did many years ago. 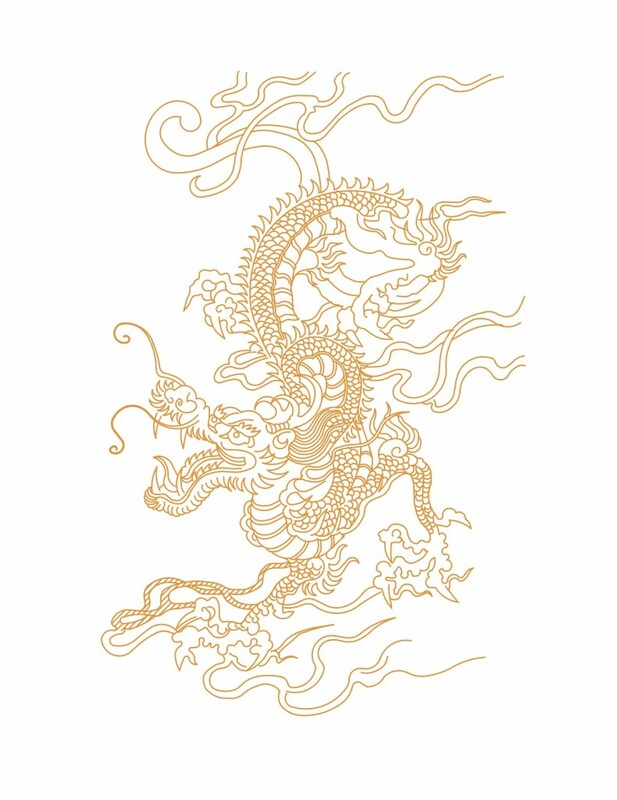 I have been drawn to the dragon for a while, it could be that I’m a dragon in the Chinese 4 pillars system (zodiac) or it could just be that I’m enamoured with what the dragon represents. This bird reminds me of the mythical feathered serpent Quetzalcoatl, a being that moves comfortably between heaven and earth. What does the dragon have to do with the coral castle? The Coral Castle and the Dragon are magical beings and places that remind us of our power to connect to heaven and earth, harness the forces of the universe, marvel at the magic that is available in every moment to create unparalleled beauty, for good. I would love to know about the places that feed your soul & awaken your imagination. The spaces that you long to revisit hold sweet medicine for your soul. I wish you an auspicious year of awakenings and magical creations. May you feel inspired to let your home become a symbol of love! Marjory!! This post made me want to get up and dance!!! Then it made me want to reach out and hug you!! Then it made me want to talk to my husband and tell him maybe we SHOULD take a long weekend in the keys (he’s been wanting to drive down and I keep putting him off) so that we can stop off in Miami for me to see this!!!!!!!! I’ve read about it several times, and just reading what you wrote here… I could feel it through you.. through your writing. My heart just aches to be there now! Then it was so interesting when you said: “Scientists say that an image that evokes a feeling or memory can light up the same part of your brain that lights up when you are physically there.” because as I read that I realized that I don’t *need* to actually physically go there (though.. mark my words, I will!) in physical form… Thanks to you I was able to visit in my mind and in my heart. Thanks so much for this oasis in my day!!! my reply got lost! Thank you for your lovely words. Your joy, your energy, your love. The keys are beautiful. Yes, go and enjoy! Wonderful post, Marjory. And the new site is fabulous. Congratulations! It is wonderful to have you visit. Thanks for your kind words! I did not even know that this place existed! There are so many places that feed my soul and unlock my magic-my office at home, a walk through the park with my child & husband, the Sangre de Cristo Mountains, the great Redwood forests of Northern California…just to name a few! So much of my work is geared towards remembering-and reminding others that the truest magic is that which we carry within us day in and day out. Thanks for your lovely words. There is magic between us and the places we inhabit, share & move through, sweetly, lovingly, consciously. This place is gorgeous, Marjory – I love the little hidden sanctuaries like that. My favorite of your photos is the moon pool! There’s a spring in Austin that has a park around it that’s lovely to wander around in, and then there’s also the botanical gardens – gorgeous at any time of year. I don’t go to these places as much as I’d like to (as much as I should?) – but every time I leave I feel totally re-centered and rejuvenated. It’s funny how sometimes we don’t allow ourselves to go to the places that replenish us the most. I hope you find time and space to go and nourish your soul. Let me know! love. Thanks Jessica :) Cemeteries are such special sacred places. I love them too. Let me know if you go and if you write about it. Thanks for your comment.